One of the attractions of Australia, as we have mentioned ad nauseum, is the climate. We just got tired of the cold and snow in Edmonton. And we also got tired of planting flowers every year that didn’t do much, and planting tomatoes that we never got to harvest because they didn’t ripen before the first frost. So, one of the benefits of this climate is that we will get to garden. We like to garden; we might not be any good at it, but we like to try. And we think Wagga might be a good place to learn how to do it well…but we know we have a lot to learn, mostly because of the different conditions. No idea where this photo (gleaned from someone else's website) was taken, but it is a good example of the kind of alien landscape we are living in. Australia has, so we’ve been told, the thinnest layer of topsoil of any continent. The person who told us that is pretty knowledgeable about Australian geography and flora, so we believe him. What there is here is a lot of fine red dirt and clay. 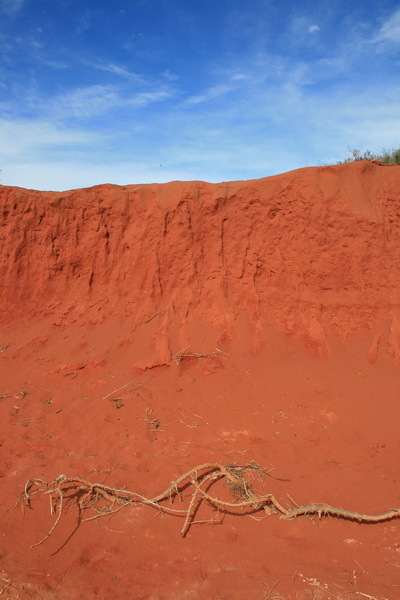 When you drive around NSW, you see it everywhere – mostly in the creek beds that have eroded; but anywhere that doesn’t have vegetation is more likely going to be red than black. We don’t know how this is for backyard gardening, such as flowers and tomatoes, but it is good for potatoes. Canadians: think PEI. Potatoes in stores here come coated in a red, sandy soil…they say they leave then unwashed because the soil protects them from the sun. We have a lot of space to plant flowers in our back yard (is it yard or garden? Brits call the whole thing garden, so do Kiwis. But we think that Aussies actually use yard). But because we only want to be in this house for a few more months, we don’t want to put a lot of effort or money into it. We couldn’t, however, not take advantage of the climate and do some gardening. We had asked the property manager about gardening, and they said it was OK as long as we returned everything to its original state when we moved out. This specifically referred to our query of whether or not we could rip up the useless paving stones in the north east corner of the back yard and put in a veggie patch, but we also didn’t want to do much in the existing shrub bed that we would have to undo. This is the kangaroo paw that we were given. Sorry if the photo doesn't actually show you what the plant is like - Dan was trying to be artistic. But then, on the Canadian Thanksgiving weekend, we had a house-warming party/Thanksgiving party. And as people are known to do, they brought us house-warming presents: one person brought us a large pot of something – we can’t remember what it is, but it is native to Australia – from her garden. 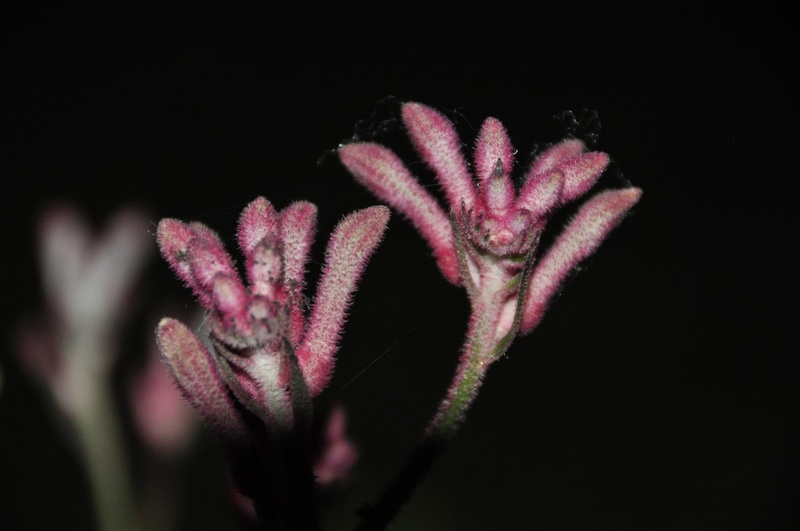 Another couple brought us a “kangaroo paw”; yes, there is some official latin generic name, but that is stupid because it is an Australian plant…it should have only an Aussie name…sure, maybe an English settler name and an Aboriginal name, but the latin one means nothing. 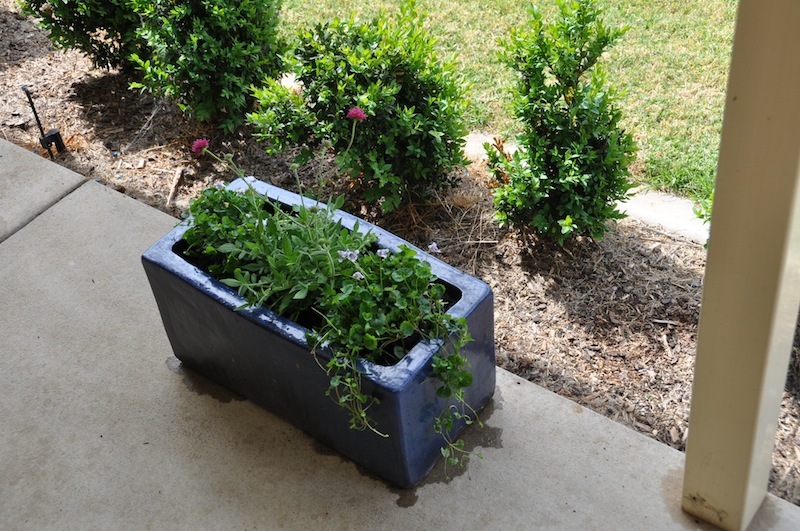 We hadn’t planned on doing any gardening, but when these arrived in pots, we thought “hey, we’ve got a huge alfresco (Oz for patio), why not do some container gardening?” So, the next weekend, off we went to Bunnings (the Oz version of Home Depot). The cheap plants don't even come with tags saying what they are - they are just generic 'potted colour'. This is summer colour, we don't know what winter colour will be. We found some pretty spectacular stuff! Unfortunately, most of it is what we want to invest in later…there aren’t really ‘annuals’ and ‘perennials’ here, like there were in Canada. There were a lot of flowering shrubs, a lot of native Australian plants, and a lot of what were listed as “seasonal colour” – the things that in Edmonton we would have planted in late May and hoped they lasted into late September. Pointing to the mature plants (10 cm pots, blooming) the guy in Bunnings said (something like) “if you are renting, these are the best choice. If you get sick of them or move after seven months, no worries, just buy some winter colour (whatever that is). And they’re only $2.” OK, $2 for a pretty big lavender plant, or osteospermum, or carnation…we’re in! So we stocked up on a bunch of those, found some nice planters for the alfresco, and headed home to dig in the red dirt. This is Lisa getting over her fear of the garden bugs. Pink gloves for girls, green gloves for boys. Digging in the ground here is…well, it is a bit different than in Canada. Even just mucking around in plants is different. Because in Canada we didn’t worry about spiders so much. Sure, there were spiders there, and we would often see them when gardening, but we didn’t worry about them. They weren’t dangerous. Here, there are red backs and white tails and who knows what else. So, Rule #1 of gardening (as set by Lisa, who yells at Dan when he breaks it) is WEAR GLOVES! And rule #2, as suggested by a friend, is that if you leave your gloves on the ground, STOMP ON THEM, HARD, BEFORE PUTTING THEM ON This will kill whatever has moved in. (Rule # 3 is WEAR SUNSCREEN AND A HAT! – coming soon is a “The sun’s different here” post.) And, rule #4 is WATCH OUT FOR SNAKES; we have many bushes in the back yard and there is only a two-lane road between our back fence and rural bushland. Of course, we have already determined that the birds in our backyard can act as an early warning system. If they disappear, we know we’re in trouble! The aptly-named bottle brush tree in our back yard. 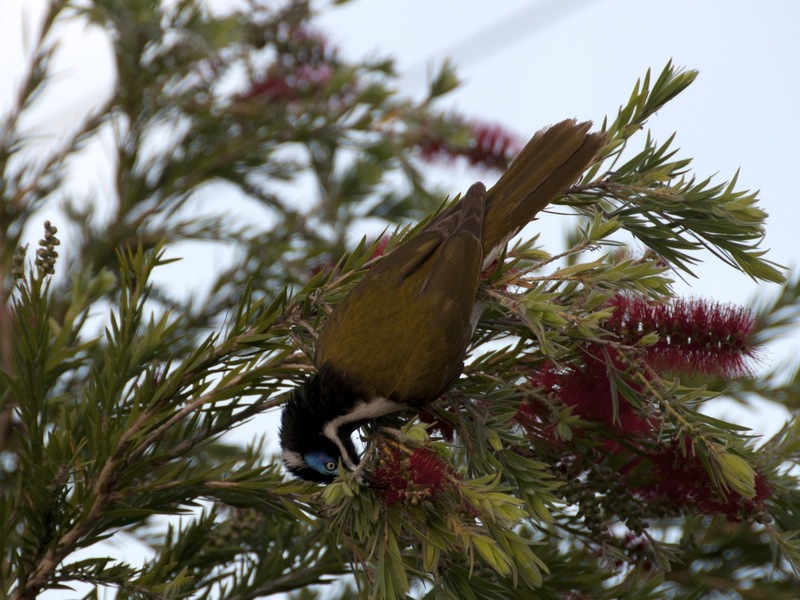 That is a blue eyed honeyeater enjoying the flower. The beds at the back of our yard have some bottle brush bushes (beautiful! ), some other flowering bushes, and palm trees. They are a bit of a mess, and who knows what lives in there besides fairy wrens and honeyeaters (see rule #4!). 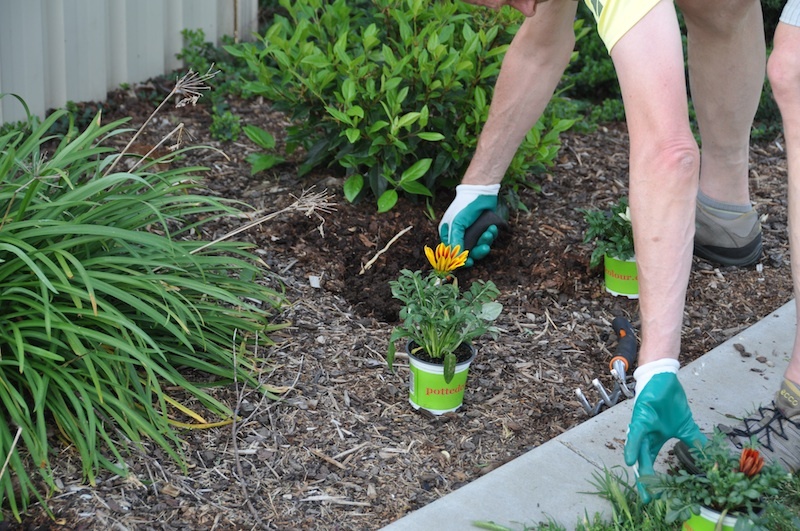 Dan went in, fearlessly weeding the shrubby areas, and planted the first bunch of flowers. We quickly realized that we hadn’t bought enough, so on Sunday went back to Bunnings for more. Because Dan had other things to do (like learning how to install the bike carrier on our car, for upcoming trips) Lisa donned her pretty pink gloves and did some planting. She finished the beds at the back and the patio pots. 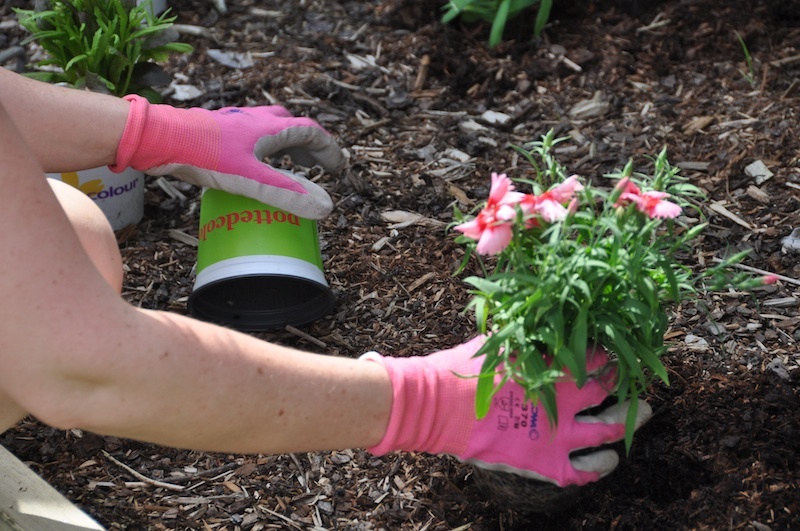 Now that we have stuff in the ground or in pots, we have to learn how to take care of them. Does ‘drought resistant’ mean that it doesn’t need much water ever, or do you have to water it until is is established? How much water does a plant need in 45 degree heat to live? Our house has a sprinkler system, so we ran the program that was already set; if that was what a previous tenant used it must make sense. This is how thee planters looked when we planted them...now, just a couple weeks later, they are filled out so much you can't see the dirt. Things grow fast here! On the weekend that we planted, temperatures got up to about 33 Celsius, and it was quite sunny. Perfect weather, really. And things seemed to do OK for a few days. Then about a week later, we noticed that some of the carnations and gazanias in the back beds were drooping. Was it too much water, or not enough? Dan opted for the latter, and soaked them, and the next day they had all perked up. So, maybe the sprinkler settings weren’t right; maybe the previous tenants didn’t know a hoe from a ‘ho? We’re curious to see how things progress. Now that we kind of have the watering figured out for now (and we’re thankful we have an in-ground sprinkler; that’s on our new house wish list, for sure! ), how do we continue into the summer? Does the lawn need more or less than the flowers? And will what we learn in the rental be transferable to wherever we buy? We didn't see this at Home Depot! 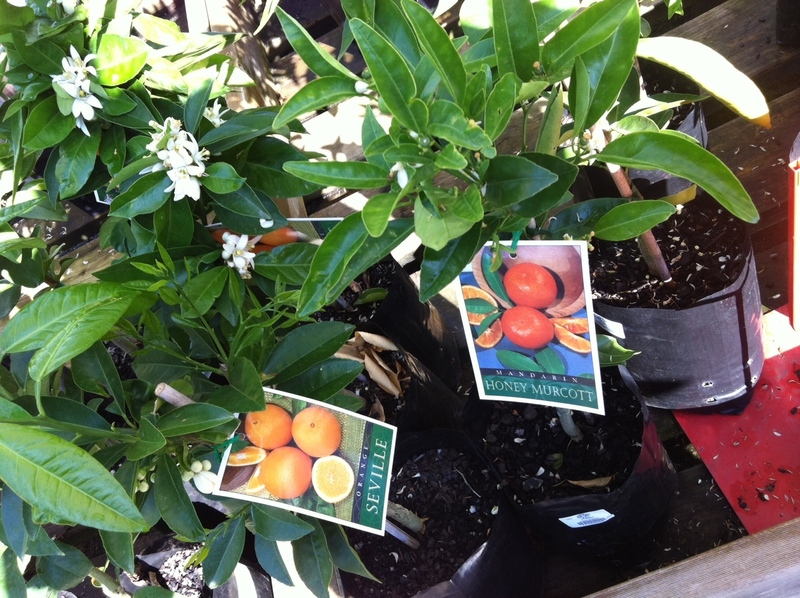 But at Bunnings, there were lots of different citrus trees to be had. These ones were patio size. We were tempted, but thought we should wait for our own place. We’ve already been told that when we move into our house, people will give us cuttings. Things grow here so well that they want to thin them anyway, so why not pass a chunk along (too bad that citrus trees didn’t propagate in the same way – we’ve actually seen branches of lemon and orange trees laying on the riverbank where they’ve been discarded, fruit and all!). One of Lisa’s colleagues mentioned that a woman had given her a few (!) Japanese maple trees (Dan’s favourite), because the yard was overgrown. She was going to throw them away (!). Such a different world. Canadians newly relocated to Australia. This entry was posted in agriculture, gardening, rural life, weather. Bookmark the permalink. Another friends’ blog. More travellers/foodies/pop culture buffs so should always be interesting!